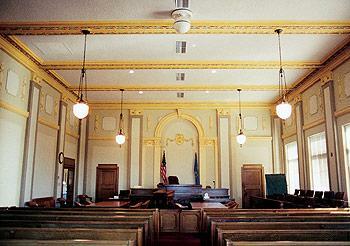 The modern courtroom is apt to have either installed or portable technology for information and evidence display; media feeds; teleconferencing; hearing impaired; foreign language translation; digital audio recording, either as a primary court record or as a court reporter back-up; video for the court record; and videoconferencing, which may include remote first appearance, remote hearing, remote testimony, and remote appellate appearance capabilities. Audio is the most critical court concern. If the participants cannot hear the proceedings, they are unable to discharge their duty, especially the jury. The all important court transcript would be meaningless if a court reporter is unable to hear the testimony. A sound reinforcement system starts with microphones placed before the judge, witnesses, attorneys, the podium, and other positions to provide coverage of the proceedings. The audio signal is then amplified throughout the room, using signal processors, amplifiers, and speakers that make live or pre-recorded audio louder, broadcasting those sounds to the court audience. Not all microphones are equal. 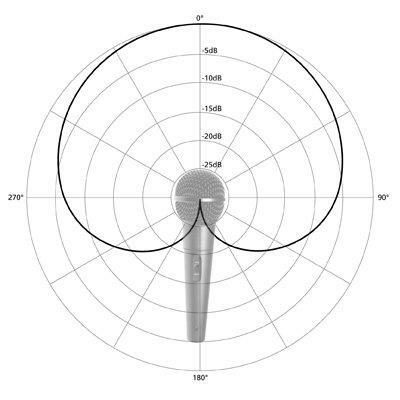 To select the right microphone, each location needs to be evaluated for how the microphone will be used. If you are amplifying a single person, a cardioid microphone is preferred. If several people are speaking from different angles, as during a bench conference, an omni-directional microphone would be the better choice. The advantage of the Cardioid mic is that it mainly picks up sound from directly in front of the microphone with less reception from the sides and little or none from behind. A microphone that is used for live performances should not be selected for courtroom use, as they are tweaked for high sound pressure environments and feedback resistance; as a result, they are not particularly sensitive. An omni-directional mic will pick up all the voices and any other sounds that are happening around the mic. Omni-directional microphones are more likely to cause feedback than uni-directional mics. The need of a court AV system to accommodate the frequent exchange of words, commonly encountered during legal proceedings has grown exponentially in recent years. An audio processor collects the sound from several microphones or other audio sources, mixes or combines them, and then distributes the resulting sound to various output devices. The signal is then amplified, recorded, or otherwise utilized. An automatic microphone mixer that turns off microphones when no one is speaking near them reduces any stray ambient noise from the speaker system. The Shure SCM810 activates only microphones being addressed, minimizing mediocre audio caused by multiple open microphones. This system can be linked for use with up to 400 microphones, allowing for a great deal of flexibility. Audio processors also include digital feedback eliminators that are used to condition the audio to the specific acoustics of the room. Clarity is improved through compressors, limiters and other processing elements of the central audio processor. Audio amplifiers create an electronic signal that produces sound through the courtroom speakers. They are often overlooked, but play an integral part in allowing all participants to hear the proceedings. Speakers need to be matched to an amplifier of proper power for each particular courtroom. Creating and controlling a courtroom sound system has now been simplified with Ashly’s PEMA™ Series multi-channel power amplifier. This application uses the pema4125.70, a 4 x 70V power amplifier with an 8 x 8 mic/line matrix mixer. It has automatic feedback suppression, ambient noise control, and equalization. The full matrix mixer with assignable routing allows any input to drive any or all amplifier outputs. Presets can be used to store and retrieve system configurations. An omni-directional hemispherical sound coverage speaker, such as Soundsphere is ideal for a courtroom. A small number of Soundsphere loudspeakers can produce even coverage and high speech intelligibility. Soundsphere speaker models are available for both high and low ceilings. The appearance of Soundsphere speakers allows them to match or complement courtroom decor. Conventional speakers produce narrow sound dispersion. Systems incorporating these speaker types require many units, carefully aimed with complex tuning in the attempt to achieve acceptable coverage and intelligibility. Soundsphere Loudspeakers produce superior sound without complex aiming and tuning. Video is becoming commonplace in many courts where the trial is recorded, either for direct use, or for later transcription. Since many depositions are video-recorded, it is rare that a court would not playback part of a deposition. Because of this, the video player and television should be upgraded to complex digital presentation systems, along with videoconference systems used for remote appearances. When a person speaks into a microphone, a switching device activates a camera linked with that microphone. Thus both the speaker’s voice and appearance is recorded. Many of these systems include multiple video recorders for backup purposes with cameras strategically placed throughout the courtroom to provide coverage of the entire courtroom. Individuals incarcerated in a county jail can make their appearance in court remotely via the video arraignment system. Video arraignments allow inmates to attend their arraignment from the jail, saving time and money while affording security to a well-publicized defendant. The inmate faces a television monitor, which has a voice-activated camera mounted next to it. The defendant’s monitor displays the judge, prosecutor, defense attorney or witness depending who is talking in the courtroom. The system is voice-activated and will automatically focus on the individual who is speaking. A camera mounted within a cabinet at the jail transmits the inmate's picture to the courtroom. A typical high-end evidence presentation system will include an overhead camera, digital video and audio players with inputs for other audio sources, a computer with CD player, a modem connection, and other support equipment. The equipment must have a “kill” switch so that the judge can block displays not intended for the jury. Individual monitors should be in front of every juror, the judge and attorneys for both sides, as well as in the witness box. With video, lighting placement is important and should include combinations of direct and indirect lighting to enhance visibility and reduce glare. The type of lighting is also critical to ensure proper coloring from video cameras. The wrong kind of lighting can cause color shifts. Our eyes compensate for this but the camera cannot. Also, glare on a monitor can make the most expensive presentation system useless if the juror cannot read the screen. Monitors should be large enough to provide for viewing comfort. For jurors, individual small flat-screen monitors provide easier viewing than a few larger ones mounted overhead. The document camera has been around for a long time and is still an important part of evidence display. A document camera consists of a vertically mounted TV camera aimed down at a flat surface. The attorney puts a photo, document, or object on the surface, and the camera instantly displays the image on the monitors to which it is routed. Most document cameras can adjust between negatives and positives, which assist in the presentation of x-rays. Digital whiteboards can either be wall mounted or set-up on rollers, allowing the judge or jury to read what is written on the board. New improved whiteboards send what is written on the board to computer monitors, which display the exact writing and colors. The writing can be saved on a computer and can be printed on a connected printer. One of the great advantages of the enhanced whiteboard is that once an image is saved to the computer, it can be seen on all of the room monitors immediately, even if it was erased in whole or part from the whiteboard itself. Whiteboards can be especially effective for witness drawings or counsel’s opening statement and closing argument. Should an original document need to be annotated, an annotation device allows a witness or attorney to mark an image being displayed through the video evidence presentation. By being connected to an annotation device, a pen can be used to highlight or show a location over an original image. 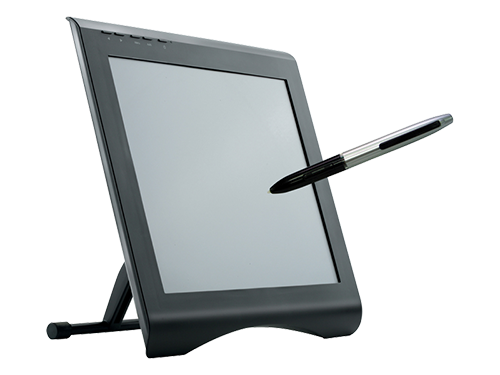 These devices are now being replaced by touch tablets, which allow a person to write with their finger or pen. Regardless of the type of AV equipment to be utilized in a courtroom, several common wiring matters must be addressed. The first is a wiring system that allows for maximum future growth. Normally, wires are placed in conduit installed in the floor or walls. While this practice is common, it should not be used, as no one can predict wiring needs in the future. An elevated floor system that permits unlimited wiring growth is preferred. Systems such as the AMP PowerFlor can be used to "retrofit" existing courtrooms. If conduit is the only alternative, the conduit size should be three times larger than presently needed for future growth. The wiring closets on each floor should have outsized easy connections to the other floors, allowing for ease of installation of wiring required to interconnect courtrooms, judge’s chambers, and other locations throughout the building. Another wiring concern is the courtroom wiring termination point, often where the courtroom equipment rack is located. This space should be easily accessible, spacious, and have adequate ventilation. All though computer software is not actually audio visual, legal software is changing the way courtrooms are being managed and future advances in this technology must be reflected in how audio visual systems are designed. Computers permit attorneys to use software-produced slide shows for opening statements and closing arguments, and to present documents, photographs, graphs, and animations. A relatively new software program, Jury Duty allows an attorney the ability to assign up to 200 potential jurors prior to Voir Dire. The seating chart view gives the layout of the jury panel and displays the juror number. Tapping on a seat brings to the screen a list of juror names, so the attorney can assign a juror to that seat. You can also drag and drop assigned jurors to any seat. 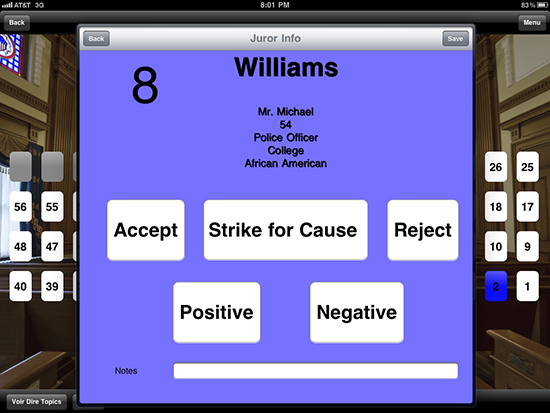 Once jurors have been assigned to a seat, tapping it again will bring up that juror's basic information, along with handy options to accept, reject, strike for cause, positive or negative impression, and a notes field. The courtroom, like all facets of our life, is seeing a surge of new technology. When planning new courtrooms, much thought has to go into where each audio visual element is to be placed. The hardest task is retrofitting an existing courtroom, which might not have the space to accommodate all of the elements of today’s and tomorrow’s technology.